Artist's impression of Joseph Smith receiving the golden plates from the angel Moroni. There are several theories as to the origin of the Book of Mormon. Most adherents to the Latter Day Saint movement view the book as a work of inspired scripture. The most common belief of adherents is that promoted by Joseph Smith, who said he translated ancient golden plates inscribed by prophets. Smith claimed the angel Moroni, a prophet in the Book of Mormon, directed him in the 1820s to a hill near his home in Palmyra, New York where the plates were buried. Besides Smith himself, there were at least 11 witnesses who said they saw the plates in 1829, and three also claiming to have been visited by an angel. Several other witnesses observed Smith dictating the text that eventually became the Book of Mormon. Critics have explored a number of issues, including (1) whether Joseph Smith actually had golden plates, or whether the text of the Book of Mormon originated in his mind or through inspiration; (2) whether it was Smith himself who composed the book's text or an associate of Smith's, such as Oliver Cowdery or Sidney Rigdon; and (3) whether the book was based on prior works, such as the View of the Hebrews, the Spalding Manuscript, or the King James Version of the Bible. There are differing views on the origin of the Book of Mormon. Miraculous origins theories generally accept Joseph Smith's own account, that he translated an ancient record compiled and abridged by Mormon, a pre-Columbian resident of the Western Hemisphere. Variations of this theory only include that the text is a divinely inspired narrative, regardless of its historicity (i.e., "Inspired Fiction"), or an example of "automatic writing". Joseph Smith as the sole author, without intentional assistance, possibly reflecting Smith's own life events. Theories of multiple authors posit collaboration with others to produce the Book of Mormon, generally citing Book of Mormon scribe Oliver Cowdrey or Sidney Rigdon as potential co-authors. 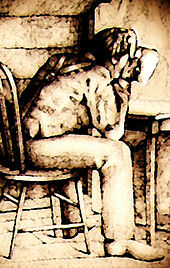 A depiction of Joseph Smith dictating the Book of Mormon by peering into a hat. According to the accounts of Joseph Smith and his associates, the original record was engraved on thin, malleable sheets of metal ("leaves") with the appearance of gold, and bound with three rings at one edge. The engraving was reportedly of considerable skill. According to the narrative of the book, the prophet-historian Mormon abridged other records of the local civilizations from the preceding millennia. Mormon then gave the record to his son, Moroni, who inscribed a few additional words of his own, and concealed the plates about AD 400. Near the end of Moroni's life (approximately AD 421), he placed these plates along with several other items in a stone box in a hillside (now named Cumorah) near present-day Palmyra, New York. By Smith's account, on September 21, 1823, this same Moroni, now an angel, appeared to Smith to instruct him about this ancient record and its destined translation into English. Smith was shown the location of the plates (and the other items in the box), but was not immediately allowed to take them. After four years of annually meeting with the angel, Smith was finally entrusted with the plates. Through the power of God and the Urim and Thummim (ancient seeing stones buried with the plates), he was able to translate the Reformed Egyptian inscriptions. Smith was commanded to show the plates to only certain people. Accounts by these individuals are recorded in the introduction of the Book of Mormon as "The Testimony of the Three Witnesses" and "The Testimony of the Eight Witnesses." Smith taught—and most Mormons believe—that the existence of the Book of Mormon was prophesied by Biblical scripture. My father, after I had finished saying what I have repeated above, looked at me a moment, raised his hand above his head and slowly said, with tears glistening in his eyes: "My son, I can swear before high heaven that what I have told you about the origin of [the Book of Mormon] is true. Your mother and sister, Mrs. Athalia Robinson, were present when that book was handed to me in Mentor, Ohio, and all I ever knew about the origin of [the Book of Mormon] was what Parley P. Pratt, Oliver Cowdery, Joseph Smith and the witnesses who claimed they saw the plates have told me, and in all of my intimacy with Joseph Smith he never told me but one story. He always without one doubt or shudder of turning affirmed the divinity and truth of the Book of Mormon. Unto all Nations, Kindreds, Tongues and People, unto whom these presents shall come: ... I wish now, standing as it were, in the very sunset of life, and in the fear of God, once [and] for all to make this public statement: That I have never at any time denied that testimony [of the Book of Mormon] or any part thereof, which has so long since been published with that book, as one of the Three Witnesses. Those who know me best well know that I have always adhered to that testimony. And that no man may be misled or doubt my present views in regard to the same, I do again affirm the truth of all my statements as then made and published ... I submit this statement to the world; God in whom I trust being my judge as to the sincerity of my motives and the faith and hope that is in me of eternal life. My sincere desire is that the world may be benefited by this plain and simple statement of the truth. According to some, the simplest explanation is that Joseph Smith authored the Book of Mormon himself, without the intentional complicity of anyone else. One argument for this theory is that the Book of Mormon reflects Smith's life experiences. There are, for instance, claimed parallels between the tree of life vision in the Book of Mormon and a dream of Joseph Smith, Sr. The golden plates were sometimes called the "Golden Bible" in early descriptions. The label "Golden Bible" predates the Book of Mormon, as legends of such an artifact circulated in Canada and upstate New York while Smith was growing up in Vermont. Smith's companion Peter Ingersoll later claimed that Smith had told him of the legend of the Canadian Golden Bible. The claim is also made that Smith was aided in the creation of the Book of Mormon by one or more co-authors, such as Sidney Rigdon or Oliver Cowdery. Both Rigdon and Cowdery had more formal education than Smith. David Persuitte highlights a revelation of Smith's from March 1829, that apparently limited Smith's power to translation. Persuitte argues the wording of the revelations indicates at least one other secret collaborator, as "if he had some partners who had imposed it upon him in order to prevent him from gathering too much power to himself." In contrast, co-authors Jerald and Sandra Tanner argue the early text of the revelation merely demonstrates that "Joseph Smith was not planning on doing any other work besides the Book of Mormon". Oliver Cowdery was a third-cousin of Lucy Mack Smith, Joseph Smith's mother. A pastor who lived near Cowdery, Ethan Smith, had written View of the Hebrews, another work that has been posited as a source for the Book of Mormon. Cowdery served as scribe during the transcription of the Book of Mormon, and was one of the Three Witnesses to the golden plates. Cowdery later resigned and was excommunicated in 1838, then re-joined the LDS Church in 1848. Sidney Rigdon was a Baptist preacher, and one of the most prominent of Smith's earliest followers. Rigdon served as a scribe for the Book of Moses, received revelations jointly with Smith, served as Smith's spokesperson, and with Smith carried the title "Prophet, Seer, and Revelator". After Smith's death, Rigdon led his own faction of Latter Day Saints and continued to announce revelations. Pointing away from Rigdon's co-authorship, there is little or no extant evidence that Smith knew of or was in contact with Rigdon until after the Book of Mormon was published, although some witness accounts place Rigdon in upstate New York in 1825 and 1826. Most histories state that Rigdon learned of the Book of Mormon from Parley P. Pratt, a member of Rigdon's Kirtland congregation, who had joined the Church of Christ in Palmyra in September 1830. Upon Pratt's return to Ohio, Rigdon reportedly learned of Smith and the Book of Mormon and was baptized by Pratt. According to these histories, only after his own baptism did Rigdon travel to New York, first meeting Smith in December 1830, nine months after the Book of Mormon's publication. Critics of the Book of Mormon cite a number of works that could have served as sources for the Book of Mormon. The King James Bible (1611) may have been a source for the Book of Mormon. In total, some 478 verses in the Book of Mormon are quoted in some form from the KJV Book of Isaiah. Segments of the Book of Mormon—1 Nephi chapters 20–21 and 2 Nephi chapters 7–8 and 12–24—match nearly word-for-word Isaiah 48:1–52:2 and 2–14 (respectively). Other parallels include Mosiah 14 with KJV Isaiah 53, 3 Nephi 22 with KJV Isaiah 54, 3 Nephi 24–25 with KJV Malachi 3–4, and 3 Nephi 12–14 with KJV Matthew 5–7. The majority of modern scholars have accepted that the sources used for the King James Version of the Bible were not the earliest or most reliable sources (see Alexandrian text-type and Dead Sea scrolls). The Book of Mormon claims to have been written at least 1100 years prior to the King James Version, but it contains many of the same peculiarities. such as Mark 16:15–18, which is quoted nearly word-for-word in Mormon 9:22–24. This passage addresses believers holding snakes and drinking poison; however, it does not appear in many early biblical manuscripts and is widely believed to have been composed in the 2nd century. 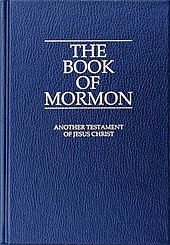 Additionally, the Book of Mormon reflects KJV literary and linguistic style. The KJV was the most commonly used translation of the Bible when the Book of Mormon was produced. It has been claimed that the books of the Apocrypha were a source for the Book of Mormon. In particular, 2 Maccabees includes the name "Nephi". In 1834, E. D. Howe in his book Mormonism Unvailed introduced a theory that Smith plagiarized from the manuscript for an unpublished novel by Solomon Spalding. Howe possessed the manuscript at the time of the Book of Mormon publication. Spalding's story, called "Manuscript Story", revolves around a group of seafaring Romans who sail to the New World some two millennia ago. Critics long speculated that Smith had access to the original script and that Smith heavily plagiarized it for the Book of Mormon. The only known manuscript was discovered in 1884 and now resides at Oberlin College in Ohio. Once the manuscript was available for study, most critics discarded this theory because the "extensive parallels" were only of a few minor details: intercontinental seafaring, the existence (and use) of a seer stone, and the discovery of records under a stone (Latin parchments vs. golden plates with "reformed Egyptian" inscriptions). Most other purported similarities, attested by various witness affidavits gathered by Doctor Philastus Hurlbut, were nonexistent. Historian Fawn Brodie expressed suspicion regarding these affidavits, claiming that the style of the statements was too similar and displayed too much uniformity. Another purported source of the Book of Mormon is View of the Hebrews, first published in 1823 by Ethan Smith (no relation), a pastor in Poultney, Vermont. Critics argue that the works share several passages and many thematic elements. Book of Mormon witness and scribe Oliver Cowdery, and his family, had attended Ethan Smith's church since November 1821. Prior to his book's publication, Ethan Smith advocated his views regarding the origins of Native Americans in sermons to his congregations. In 1825, Ethan Smith published an expanded second edition of View of the Hebrews, the same year that Cowdery left Poultney for New York state. Mormon apologist B. H. Roberts authored a manuscript titled Studies of the Book of Mormon, comparing the content of the Book of Mormon with View of the Hebrews. Roberts concluded, assuming a hemispheric geography theory for the Book of Mormon, sufficient parallels existed that future critics could claim that View of the Hebrews had provided a structural foundation for the Book of Mormon story. Roberts's manuscript was private and shared only with LDS Church leadership. Roberts continued to publicly support the miraculous origin theory of the Book of Mormon. Development of the New World from the Old via a long journey over "seas" of "many waters"
Burial of a "lost book" with "yellow leaves"
David Persuitte has also presented a large number of parallels between the View of the Hebrews and the Book of Mormon, but notes there are no instances of direct copying. The parallels that Persuitte presents cover a broad range of topics, including religious ideas about the responsibility of the American people in convincing the Indians of their "Israelite" origins and converting them to Christianity. Persuitte quotes from View of the Hebrews Ethan Smith's theory about what happened to the ancient Israelites after they arrived in America. He argues that it essentially summarizes the basic narrative of the Book of Mormon, including the split into two factions (civilized and savage). Persuitte also quotes several similar descriptions of structures built by the civilized faction, the wars between the two factions, and other similarities. According to Persuitte, these are sufficient to have "inspired" Joseph Smith to have written the Book of Mormon. Joseph Smith himself mentioned Ethan Smith and cited passages from View of the Hebrews in an article from the June 1842 publication of Times and Seasons. Critics have claimed several passages and thematic material in the Book of Mormon are found in Josiah Priest's The Wonders of Nature, published in 1825. The Late War is an account of the War of 1812 which is written in the style of the King James Bible. The 2008 work Mormon Parallels and a 2010 work have discussed possible similarities. In 2013, The Late War was the subject of discussion among both ex-Mormons and Mormon apologists. Mormon authors claim that the description of olive horticulture in Jacob 5 is too specific and detailed for Smith to have learned on his own in early 19th century New England, so they assert it is evidence that Smith's story of the Book of Mormon's divine origin is true. Critics assert that the narrative could have been completely based on the biblical texts in Isaiah 5 and Romans 11 and point out that midway through Jacob 5 Smith switches from an allegory of a single olive tree to an allegory of a vineyard, reflecting his imperfect use of the biblical texts. ^ Dunn 2002, pp. 29, 33 Dunn concludes, "It is clear that Smith's translation experience fits comfortably within the larger world of scrying, channeling, and automatic writing." ^ Words of Mormon 1:3–6. ^ a b Book of Mormon Introduction. ^ See Joseph Smith–History 1 for a complete record of Smith's account. ^ Mormons believe that the following biblical passages prophesy or otherwise support the existence of the Book of Mormon: Psalm 85:11; Ezekiel 37:15–20; John 10: 15–16; 2 Corinthians 13:1; Revelation 14:6–7. ^ Elizabeth Cowdery to David Whitmer, March 8, 1887, published in the religious periodical The Return 3, no. 5 (Dec. 1892): page 7. ^ David Whitmer as published in the Conservator, Richmond, Missouri, March 25, 1881. ^ David Whitmer, An Address to All Believers in Christ (Richmond, Mo. : David Whitmer, 1887), p. 8. ^ "Book of Mormon/Plagiarism accusations/Joseph Smith, Sr.'s dream and Lehi's vision - FairMormon". en.fairmormon.org. ^ Fawn M. Brodie, No Man Knows My History: The Life of Joseph Smith (New York: Alfred A. Knopf, 1945) p. 58; Hal Hougey, The Truth About the "Lehi Tree-of-Life" Stone (Concord: Pacific Publishing Co., 1963); Grant H. Palmer, An Insider's View of Mormon Origins (Salt Lake City, Utah: Signature Books, 2002) pp. 70–71; Dan Vogel, Joseph Smith: The Making of a Prophet (Salt Lake City, utah: Signature Books, 2004). ^ Harrod, Allen F (2011-11-08). Deception by Design. ISBN 9781449727970. ^ "E. D. Howe's Mormonism Unvailed, Part 5 of 5". www.solomonspalding.com. ^ David Persuitte, Joseph Smith and the Origins of The Book of Mormon, 2d ed., p. 18. ^ "Changing the Revelations, The Case Against Mormonism Chapter 6". www.utlm.org. ^ See the New International Version Bible, 1984, Mark 16: "The most reliable early manuscripts and other ancient witnesses do not have Mark 16:9–20." ^ For arguments regarding Manuscript Story, see Brown, Matthew, "Solomon Spaulding and the Book of Mormon"
^ B. H. Roberts, New Witnesses for God, 3 vols. [Salt Lake City: Deseret News, 1909], 3:89-90. ^ Grant H. Palmer, An Insider's View of Mormon Origins (Salt Lake City, Utah: Signature Books, 2002), 60–64. 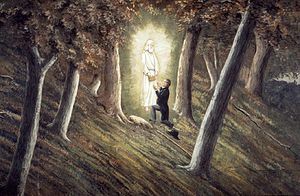 ^ Joseph Smith, Times and Seasons 3:15 (1 June 1842): 813–15. ^ For argument regarding "The Golden Pot: A Modern Fairy Tale, see "Book of Mormon/Authorship theories/Golden Pot". For a copy of the 1827 English edition of this book, see page scans at Hathi Trust (copyright page) and read the actual story here. ^ Tanner, Jerald and Sandra (2010). Joseph Smith's Plagiarism of the Bible in the Book of Mormon. UTLM. ^ McGuire, Benjamin L. (2013). "The Late War Against the Book of Mormon". Interpreter: A Journal of Mormon Scripture (7): 323–355. ^ Schaalje, G. Bruce (November 2013). "A Bayesian Cease-Fire in the Late War on the Book of Mormon". Interpreter: A Journal of Mormon Scripture. ^ Dennis L. Largey, ed. (2003). Book of Mormon Reference Companion. Deseret Book Co. p. 620. ISBN 1573452319. ^ "The Allegory of the Olive Tree - Neal A. Maxwell Institute for Religious Scholarship". Retrieved 2017-09-05. Brewster, Quinn (1996), "The Structure of the Book of Mormon: A Theory of Evolutionary Development", Dialogue: A Journal of Mormon Thought, 29 (2): 109–140 . Brodie, Fawn M (1971), No Man Knows My History, New York: Knopf, ISBN 0-679-73054-0 . Bushman, Richard L (2005), Joseph Smith: Rough Stone Rolling, New York: Alfred A. Knopf, ISBN 1-4000-4270-4 . Cowdrey, Wayne L; Davis, Howard A; Vinik, Arthur (2005). Who Really Wrote the Book of Mormon? The Spalding Enigma. St. Louis: Concordia Publishing House. ISBN 0-7586-0527-7. .
Dunn, Scott C (May 2002), Vogel, Dan; Metcalf, Brent Lee (eds. ), "Automaticity and the Dictation of the Book of Mormon", American Apocrypha: Essays on the Book of Mormon, Salt Lake City, Utah: Signature Books: 17–46, ISBN 1-56085-151-1 . Faulring, Scott H (June 2000), "The Return of Oliver Cowdery", The Disciple as Witness: Essays on Latter-day Saint History and Doctrine in Honor of Richard Lloyd Anderson, Provo, Utah: Maxwell Institute, archived from the original on 2007-10-13, retrieved 2007-05-19 . Givens, Terryl (2002), By the Hand of Mormon: The American Scripture That Launched a New World Religion, Oxford University Press, ISBN 0-19-516888-7 . Howe, Eber D (1834), Mormonism Unvailed, Painesville, Ohio: Telegraph Press . Jessee, Dean C. (1970), "The Original Book of Mormon Manuscript" (PDF), BYU Studies, 10 (3): 259–278 . Mauss, Armand L (2003), All Abraham's Children: Changing Mormon Conceptions of Race and Lineage, Illinois: University of Illinois Press, ISBN 0-252-02803-1 . Midgley, Louis C (1997), Reynolds, Noel B (ed. ), "Who Really Wrote the Book of Mormon? : The Critics and Their Theories", Book of Mormon Authorship Revisited: the Evidence for Ancient Origins, Provo, Utah: Foundation for Ancient Research and Mormon Studies: 101–139, ISBN 0-934893-25-X . Persuitte, David (October 2000), Joseph Smith and the Origins of The Book of Mormon (second ed. ), McFarland & Company, ISBN 0-7864-0826-X . Price, Robert M (Fall 2002), "Prophecy and Palimpsest", Dialogue: A Journal of Mormon Thought, 35 (3), retrieved 2007-04-30 . Skousen, Royal (May 2001), "The Original Manuscript of the Book of Mormon: Typographical Facsimile of the Extant Text", Book of Mormon Critical Text Project, Provo, Utah: Foundation for Ancient Research and Mormon Studies, 1, ISBN 0-934893-04-7 . Skousen, Royal (January 2001), "The Printer's Manuscript of the Book of Mormon : typographical facsimile of the entire text in two parts", Book of Mormon Critical Text Project, Provo, Utah: Foundation for Ancient Research and Mormon Studies, Brigham Young University, 2 (1), ISBN 0-934893-05-5 . Skousen, Royal (March 2001), "The Printer's Manuscript of the Book of Mormon : typographical facsimile of the entire text in two parts", Book of Mormon Critical Text Project, Provo, Utah: Foundation for Ancient Research and Mormon Studies, Brigham Young University, 2 (2), ISBN 0-934893-06-3 . Skousen, Royal (2004), "Analysis of Textual Variants of the Book of Mormon", Book of Mormon Critical Text Project, Provo, Utah: Foundation for Ancient Research and Mormon Studies, Brigham Young University, 4 (1), ISBN 0-934893-07-1 . Skousen, Royal Skousen (2005), "Analysis of Textual Variants of the Book of Mormon", Book of Mormon Critical Text Project, Provo, Utah: Foundation for Ancient Research and Mormon Studies, Brigham Young University, 4 (2), ISBN 0-934893-08-X . Skousen, Royal (2006), "Analysis of Textual Variants of the Book of Mormon", Book of Mormon Critical Text Project, Provo, Utah: Foundation for Ancient Research and Mormon Studies, Brigham Young University, 4 (3), ISBN 0-934893-11-X . Smith, James E (1997), Noel B. Reynolds (ed. ), "How Many Nephites? : The Book of Mormon at the Bar of Demography", Book of Mormon Authorship Revisited, Deseret Book Company and Foundation for Ancient Research and Mormon Studies, ISBN 0-934893-25-X . Sorenson, John L (1985), An Ancient American Setting for the Book of Mormon, Salt Lake City, Utah: Deseret Book and The Foundation for Ancient Research and Mormon Studies, ISBN 0-87747-608-X . Southerton, Simon G (2004), Losing a Lost Tribe: Native Americans, DNA and the Mormon Church, Salt Lake City: Signature Books, ISBN 1-56085-181-3 . Spaulding, Solomon (1996), Reeve, Rex C (ed. ), Manuscript Found: The Complete Original "Spaulding" Manuscript, Provo, Utah: Religious Studies Center, Brigham Young University . Tvedtnes, John A (1984), "Isaiah Variants in the Book of Mormon", Featured Papers, Provo, Utah: Maxwell Institute, retrieved 2007-04-16 . Vogel, Dan (2004), Joseph Smith: The Making of a Prophet, Salt Lake City: Signature Books, ISBN 1-56085-179-1 .